Synopsis: A romantic comedy about high school students living in top 1% high society, learning about love and friendship. Things get turned topsy turvy when the students end up getting tangled with a girl from lower class who is the heir of “poverty”, and romance unfolds. Why Park Shin Hye and Lee Min Ho Filmed In The U.S.
Not only did Lee Min Ho and Park Shin Hye film some scenes from "The Heirs" in California but the drama is more American than you might imagine. "The Heirs" is the first kdrama to be co-produced by an American company. It's a co-production between Hwa & Dam Pictures and the American online distributor of much kdrama magic, DramaFever. "We came onboard as a co-producer because we helped the production find and secure financing, and our involvement did indeed have something to do with the shoot in LA," said Martina Lee of DramaFever. The series will premiere this week in the U.S., Canada and Latin America only on DramaFever. The first episode will premiere internationally on SBS on Oct. 9. Each following week SBS and DramaFever will air two consecutive episodes for a total of 10 weeks. Kdrama lovers may be seeing more co-productions in the future. "In the coming months, and certainly into 2014, we'll be developing and co-producing more original made-for-web and broadcast-level programming," said Suk Park, DramaFever's co-founder and co-CEO. "We're thrilled to be partnering with such a prominent international production team like Hwa & Dam Pictures on our first move into original content." Does more American involvement in kdramas mean American fans will see more of the actors? It's possible. While the actors are currently filming in Korea and don't have immediate plans to return to the U.S., a future promotional appearance is possible. "We may have a surprise or two up our sleeves," said Martina Lee. In the drama about the wealthy students of an elite school, rich heir Lee Min Ho falls for a poor girl played by Park Shin Hye. The cast also includes f(x)'s Krystal, Kang Min Hyuk, Kim Ji Won, Choi Jin Hyuk, Im Joo Eun, Kang Ha Neul and Park Hyung Sik. Kim Eun Sook, who wrote "Secret Garden" and "Gentleman's Dignity," is the screenwriter. Kang Hyo Shin, who directed "Tazza" and "Midas" is the director. Lee Hong Ki of F.T. Island recently signed up to sing on the OST and more stars are sure to join in. If an American company were ever going to co-produce a drama, this would definitely be a great one to start with. Interest is already so high. And DramaFever is well known to American fans. It has found a devoted audience abroad, with fans no less passionate those in Korea. A diverse group of viewers, 85 percent of whom are of non-Asian descent, these international fans have discovered Korean dramas in part thanks to increased availability of dramas and their fan communities online. Thank you for creating this thread!It would have been such a waste if there was no thread for this couple. Such beautiful people Minho and Shinhye and definitely not bored at looking. The drama is 20 episodes I'm sure there will be more cute moments to come. All just for the good memories of these two. Posters please come in and share your news. Cheers! 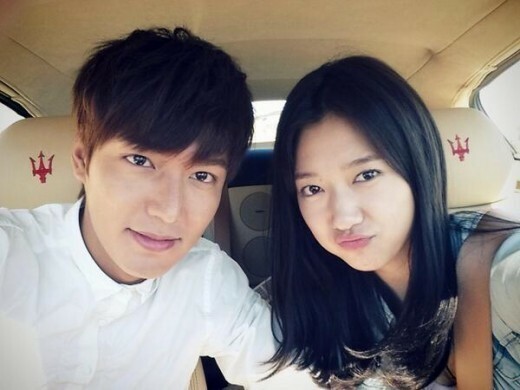 A couple photo of Lee Minho and Park Shinhye has been gaining attention. Park Shinhye uploaded a picture on her Twitter on the 10th with the words “What will happen between these two? The charming Kim Tan and the slovenly Cha Eunsang.” The picture shows the two looking comfortable together with their faces close together while looking at the camera with slight smiles. The big eyes of the two gained attention. Lee Minho and Park Shinhye are currently starring in the new SBS drama ‘Heirs’ playing the characters of Kim Tan, a conglomerate heir, and Cha Eunsang, an heir to poverty. laquetahodge MinHye are so adorable, aren't they? There should be more loveable moments between the two as The Heirs continues its run on television in the next two months. By then, hopefully this thread will have more activity. I don't understand. I thought there's a lot of love for our Heirs couple. Come on guys don't you think they are the best looking couple at the moment? Can't let our couple lose to other drama OTPs. Let's show them more love. @thao...Thank you! Please post some more.. It's hard to believe but there are quite a few kdrama actors who don't like the way they look. Both Lee Min Ho and Park Shin Hye were recently quoted as saying they did not like their looks. Park Shin Hye, who stars in "The Heirs" with Lee Min Ho, does not think she is attractive and in the past considered getting plastic surgery on her nose. "As the tip of my nose is slightly crooked, I got comments from people saying that I looked ugly, or that the end of my nose looked like it was split in the middle," she said. But she decided that although she did not consider herself attractive, she would learn to love her nose and the way she looked. "I now consider it unique," she said. And so do her fans. In not liking herself she has something in common with her co-star Lee Min Ho. Accused of always looking in the mirror, he explained that he was concerned about his sideburns. But he admits to also being insecure about his looks. He does not think he is handsome. "My face and my defined double eyelids cause me some insecurity," said Lee Min Ho. He thinks that he is not as good looking as his male co-stars Kim Woo Bin or Park Hyung Sik. He envies Kim Woo Bin's fair skin and Park Hyung Sik's cute features. Meanwhile Infnite's L, who was cute enough to play the young So Ji Sub on "The Master's Sun" and an indie rocker with idol potential in "Shut Up Flower Boy Band" does not like his looks. When asked how he felt about his face, he said, "I'm not satisfied with it. I always wished my face had more character to it." And Yeo Jin Goo, who appeared as the young Park Yoo Chun in "Missing You" and appears as a boy with five criminal fathers in the film "Hwai," does not think much of his looks either. "Honestly, I don't think I am a good looking actor," said the 17-year-old. Fans would disagree. And more actresses these days admit to having surgery when they don't like their looks. Lee Si Young, who appeared in "Boys Over Flowers" thought that her face was too plump so she had surgery at age 23. Lee Da Hae admitted to having work done and Kim Yoon Hye, known as Woori, was so unhappy with her looks that she made some changes. "My eyes, nose and mouth are all mine but because people did not like the line underneath, I changed it," said Woori. "Now I am more confident." Hopefully, Lee Min Ho and Park Shin Hye will never be persuaded to have plastic surgery. I'm a fan of PSH since STH, but i must admit that when i heard that she will be paired-up with LMH, i felt nervous about so many things..like, will they have a good chemistry? will his fans like her? will people like them together? will the number of bashers increase? but now,after reading so many positive reviews about their pairing, i felt happy and relieved. 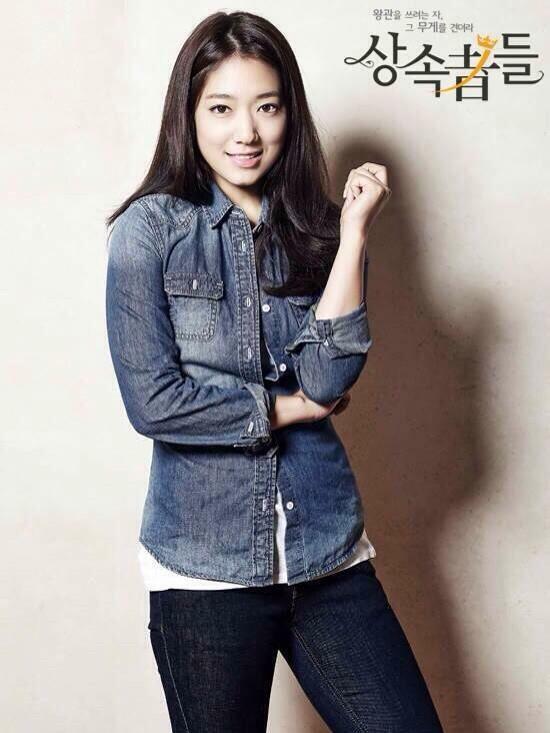 gud evening,im so happy to see this tread..i love lee min ho ang park shin hye..cant wait for episode 3 of heirs. I have to admit, this thread got me curious, especially since I started watching Heirs. 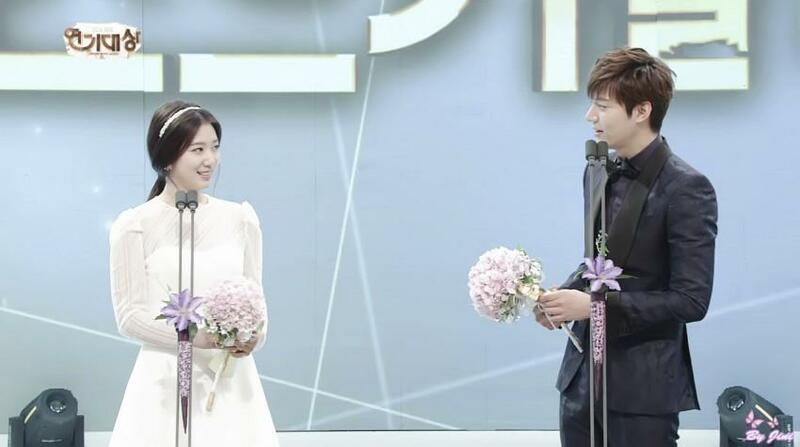 I know PSH and LMH worked together before on a cf, but we'll see if/how they change throughout this drama. Looking forward to any and all developments! Thanks for starting this thread. 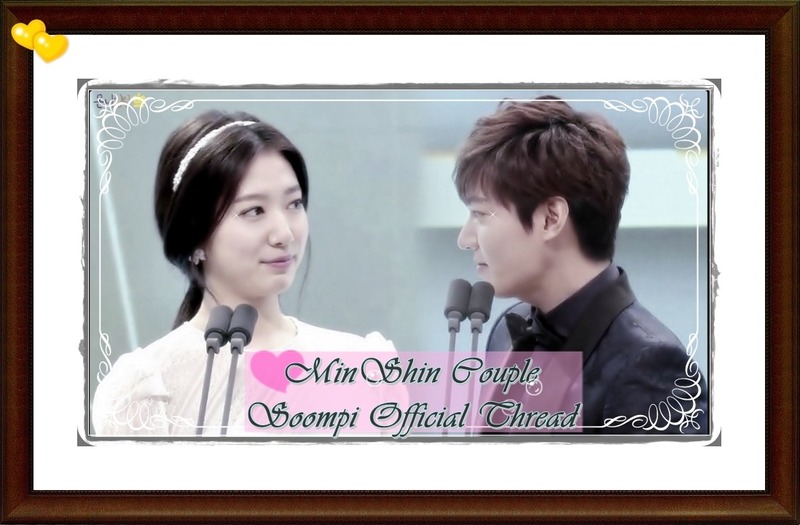 Min Ho & Shin Hye are soooo cute! I am surprised that this thread is so empty considering how popular HEIRS is. lol @ minminsarang because most of their fans are quite mature (Like I ship their characters than that actors themselves as I look forward to their drama) or have other ship that they supported for a long time already ( JGS and JYH for PSH /GHS and PMY for LMH) .